COMPOSILITE-2(TM) measures 23.5 in. from front edge of hanger to centerline of axle. It provides 9 in. 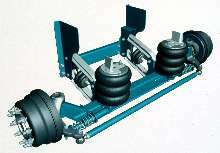 of lift, total axle travel of 13.5 in. and wheel cut of 28Â°. Bronze bushings at kingpin connection extend life of knuckle assembly. Stabilizer utilizes cover to protect rod from dirt and debris throughout travel. Zero torsion bushings spin freely to eliminate bushing windup. In-line air springs remove risk of possible driveline interference. HEBRON, OHIO - Hendrickson enhanced COMPOSILITE(TM) by incorporating new reduced-maintenance components while decreasing suspension weight to less than 800 pounds -- creating COMPOSILITE-2(TM). "Over the past year the trucking market has had its share of ups and downs. At the request of customers, we decided to simplify and consolidate our product offering," reports Paul Brown, marketing manager of Hendrickson auxiliary axle division. "We have combined the best features of the HLUS-2 PARALIFT(TM) ULTRA and the HLUCL COMPOSILITE and added additional features while continuing to use industry standard components to create COMPOSLITE-2," Brown adds. COMPOSILITE-2 offers aluminum beams, a new bushing design and an improved stabilizer design. The aluminum beams provide lightweight material for an optimized design that reduces the packaging space of the suspension. Bronze bushings at the kingpin connection extend the life of the knuckle assembly. The new stabilizer design utilizes a cover to protect the stabilizer rod from dirt and debris throughout travel. COMPOSILITE-2 maintains features introduced in the original version. A composite tie-rod provides a weight savings without compromising the durability of the suspension. Zero torsion bushings spin freely to eliminate bushing windup. This provides more consistent down force and reduced lift force resistance; therefore, only one half the amount of force is required to operate the lift axle. The in-line air springs provide maximized packaging space and remove the risk of possible driveline interference. COMPOSILITE-2 measures 23.5 inches from front edge of hanger to centerline of axle, which is 1.25 inches shorter than the original version allowing multiple axle configurations. COMPOSILITE-2 provides nine inches of lift, 13.5 inches of total axle travel and a wheel cut of 28 degrees. For additional information about the new COMPOSILITE-2 or any Hendrickson lift axle, contact Hendrickson Auxiliary Axle Systems, Hebron, Ohio, toll free at 800-660-2829 or 800-660-2843. Hendrickson International is one of the largest global suppliers of truck and tractor suspensions; trailer suspensions; lift, trailer and steer axles; springs; bumpers, and stamped components to the commercial transportation industry. Headquartered in Woodridge, Ill., Hendrickson has been meeting the needs of the transportation industry for 90 years. Visit the Hendrickson web site at www.hendrickson-intl.com.